Dear Friday, I'm glad you're here! The week has zipped by and I am hoping next week will be the same! Dear Moving Boxes, please pack and in pack yourselves! Thanks! Dear One Step Ministry, I am so glad we could hand off so much of what we no longer need! I really hope what we gave you will be used! Thank you for taking approx 5 large bags of our clothes, some old housewares, and various other items! It means a lot to us that we could unload that stuff an make sure it as going to a good place! Dear Sweet Lily, how I love you! This week it as so nice to spend a night with just you and me! I know we missed the boy being home, but I also glad I had you to share the apartment with! It meant a bunch that you climbed up on my lap after a long hard day in our seemingly empty home! I also love that i had you to share the bed with! Thanks for keeping me company! Dear Hubby, I am so glad you are home! It was hard not having you to welcome me home, help with heavy lifting, encourage me, and just be there to keep me company! I missed you for sure and love having you home! Also, I pretty much can't believe that that was our first night apart in the last 2 years and 4 months of marriage! I love you! And so does Lily! Dear Readers, I have so enjoyed the comment love lately, I am normally really great about repsponding once a week to all your thoughts, however, lately, packing boxes has taken priority. Your comments, kind words, questions and blogger love have not been ignored. My responses are merely on hold for now! Dear Students, I love you all, but stop being obnoxious! Be warned that Evie will be sharing with Santa how much grey hair you are creating for your teacher! I hope you all have a lovely Friday! 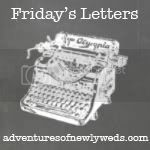 Go check out all the other wonderful Friday letters! Wow! I am so off this week! My hubs was out of town early monday morning until late on Tuesday night. I took advantage of the alone time and tried to get a bunch of stuff done. Yep, that's right i did not really relax. I did an insane amount of laundry, prepard meals for the week and packed a few boxes while also getting donations ready (again)! Needless to say, my mind has not been on Christmas AT. ALL. I even got an email from my sister asking what we wanted for Christmas... i quickly gave standard answers like clothes and gift cards .... but here are some more specifics. Thank goodness for Random Thursday! A Hulu and/or a a Netflix gift card wouldnt be that bad either! I love the one i have and can't find one here in the US that i have to have. Maybe my sister will read my blog and maybe purchase a cool/cute one for me again! Any color, but i sure do love these beauties! And some more wardrobe ideas on my Christmas wish list! Love this sweater and the bag isnt bad either! I love the sweater and the belt combo! Must do this! Oh and did i mention that a moving fairy would be nice too! Our classroom elf has done great! I am still not completely sold on the fact that the kids have changed their behavior, but nonetheless, it is worth it to see their faces each morning when they find this curious little elf! I have a lot more ideas to do and I can't wait to share them with you! Here are some of Evie's adventures from the last week! She pulled out the Christmas tree and left the decorating up to us! Began our count down to Christmas! Pulled out all of our Christmas story books and displayed them nicely and then read a book! Took a rocket ship to visit Santa and then lounged in it all day! We did have one curious little kiddo who touched our Evie and she rested for an ENTIRE day until she could get her magic back! That student got to write an apology letter to the whole class! Today we wrote about our elf and i will share those journals next week! Hope you've enjoyed Evie's adventures this week! but tonight, i changed that a bit by finishing up our Christmas card on Shutterfly! I have always loved their cards and I cannot wait to receive these! Hope you enjoy your holiday season! Consider this your Christmas card from this blog too! Haven't counted my High Fives in a while.... Here they are from the last couple weeks. Bunco with a great group of ladies. I am not a part of the group but they really are friendly and welcoming. Someday i hope to form a group or join a great one like the two i have subbed in! dinner out at Mimi's with our life group was great! I know it is hard to meet every week, but truth is, every time we end another season of group, I begin to miss these people! It really is nice to meet with a bunch of people every week! Life can get too busy, but having a group like this truly helps to feel like you have a home base! Looking forward to getting the big move over with and the packing has definitely begun! Stay tuned for a post on how i am determined to keep this move OR-GAN-IZED! After several days with severe pain, my hubs went to a follow up appointment with our family doctor. Finally he has been diagnosed with shingles! Ugh! So glad he is diagnosed and now has received some help for the pain! Go HERE for more info on shingles! These people we have in our lives have really come through for us lately. Whether it is offering to help us move, stating that they are glad we are in their lives, someone who will listen, someone who will check in with us, or even just taking the time to listen to us. They are really phenomenal people! All of them! We are so glad to have great people in out lives. That is my High Five for the week... or the last two! Head on over to Lauren's blog to check out other high fives! I am not putting much thought into this, but i believe i only have one that is truly stange the other seems pretty normal but maybe it is strange to some! Ok, so I have not done this in a number of years. In fact, it was probably high school when i did it last. Either way, i think this one is a bit strange, but i still would eat it! It's like crispy french fries and ketchup! Yum! Yep, love this stuff. Does this count as strange or bizarre? Be sure to check out the other linky party friends! They may make me look super bizarre but then again they may make me look completely normal! P. Finding pictures of these bizarre combinations on the internet means they are not so strange right? Eh, oh well! I tried! I am trying something new in my classroom this year. Yep, that's right, that little elf we have seen all over Pinterest, Instagram, and heard people chatting about around the water cooler, has made its way into my classroom! Today we read the book and I was SHOCKED! I did not have a single child who said "I don't believe in Santa!" This has me thinking that this curious little elf just might work. Our little elf's name is Evie and today we welcomed her into our classroom. I am not sure how it went over because i had to step out for an IEP, but i am hoping it went well! Either way I am hoping to update yo all every week about Evie and her whereabouts in my classroom. It should be fun! I have a few non-mess making less mischievous ideas for her location! For those that don't know: There are hundreds of elves that make their way into the homes of children to help Santa check his list. The elves report back nightly and before the children wake up the elf finds a new spot. Half the fun is finding the elf in a new spot every day. The trick is that the elf cannot be touched! Or else it will loose all its magic! So in the coming 2+ weeks you will see an update of all of Evie's adventures! Let's hope my kiddos believe and that they have a little bit of Christmas cheer! Have you tried the Elf on the Shelf with your kids? Have you ever used it in a classroom setting? PS. I know many people are anti-elf! I see their point, however this is one way that i am hoping may coax excellent behavior out of the kiddos! I may even spread a little Christmas cheer! The weekend is over and my husband and I officially will have a roof over our heads come January! We are relieved to find a place that is cheaper that what we have now and also that is still in the same area. Which if you know Irvine, CA, you know that the words "cheaper" and "rent" don't go hand in hand! Either way we are moving! So that means instead of a beautiful picture of a Christmas tree on this here bloggy blog, there will be none of the sort! Yep, that's right, no Christmas decorations here! I am grateful for a place but I do have to say I miss the holiday cheer spreading to my home!